Precise diagnosis of pilomatricoma pose diagnostic difficulties upon clinical findings alone., Pilomatricoma presenting as a giant hypopigmented nodule on the arm is rarely documented. We encountered a swelling fixed to the skin but freely movable over the underlying tissues, growing over the lateral aspect of left lower arm since 1 month in a 23-year-old male. The skin overlying showed peculiar whitish discoloration or hypopigmentation. Cytological examination showed features of skin adnexal tumor which was then confirmed histopathologically as benign pilomatricoma. Although histologic features of this lesion are well-recognized, pathologists continue to encounter difficulties in diagnosis on aspiration cytology owing to varying presence of basaloid cells, ghost cells and foreign body giant cells in the yield, which forms the diagnostic triad. This study highlights the unusual presentation and cytomorphological challenges faced in arriving at a precise diagnosis of pilomatricoma. A 23-year-old male patient presented with a well-defined, firm, mobile, nontender subcutaneous swelling adherent to the skin over the lateral aspect of left lower arm since 1 month [Figure 1]a. The swelling had increased to present size of 5 cm × 4 cm. The overlying skin showed whitish discoloration. There was no history of trauma at the site of swelling. Systemic examination findings were unremarkable. There was no relevant family history. 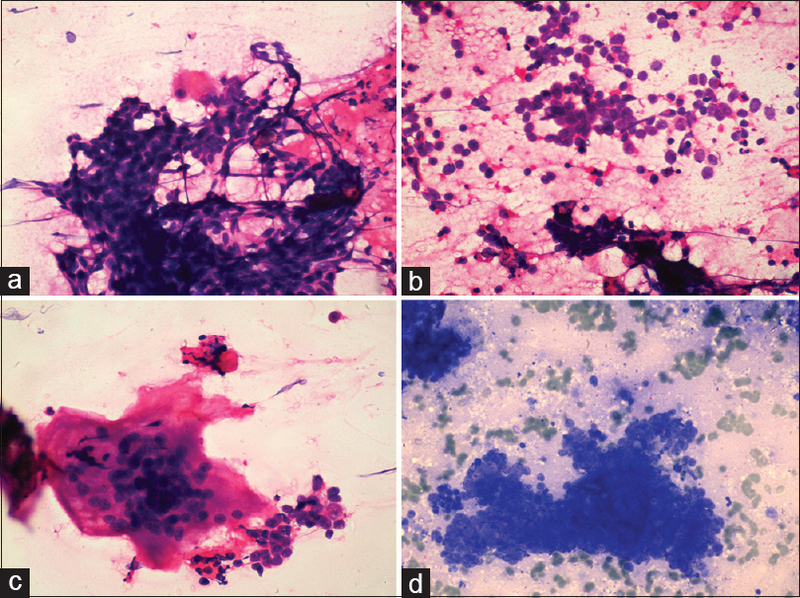 Fine needle aspiration cytology (FNAC) was performed which showed richly cellular smears composed of tight clusters, sheets, and singly scattered basaloid cells [Figure 2]a. The cells had a vesicular nucleus with prominent nucleoli and moderate amount of cytoplasm [Figure 2]b and [Figure 2]d. There was also seen necrosis with karyorrhectic debris with few giant cells [Figure 2]a and [Figure 2]c. A cytological diagnosis of skin adnexal tumor was offered. Subsequently, the swelling was excised and sent for histopathological examination. Postoperatively the patient is disease free with no evidence of recurrence for 6 months [Figure 1]. On gross examination, the swelling was 6 cm × 5 cm × 4 cm, relatively well-defined and covered with skin which showed whitish discoloration. On cut section, brownish white friable areas were noted [Figure 1]b. On microscopic examination, a well-circumscribed, unencapsulated lesion composed of solid sheets of small basaloid cells made up of uniform, a small vesicular nucleus with scanty cytoplasm undergoing abrupt keratinization and at places transition into ghost cells was noted. The basaloid cells showed the presence of about 4 mitosis/high power field (HPF). At one focus, an area of necrosis was also seen within the basaloid cells. Foreign body giant cell reaction and squamous differentiation were noted [Figure 3]. In view of the presence of ghost cells, circumscribed margins and lack of pleomorphism, histopathological diagnosis of pilomatricoma was offered. The margins were clear. On review of the FNAC smears, occasional ghost cells were identified in the smears and specific diagnosis of pilomatricoma was arrived. Pilomatricoma also known as pilomatrixoma or calcifying epithelioma of Malherbe account for 0.12% of all skin tumors. It is a benign slow-growing neoplasm originating from pluripotential cells of the outer sheath cell of the hair follicle root. It is most often diagnosed in young children, is more common in females, and shows a predilection for the head and neck region. Involvement of the upper extremity is relatively uncommon. Clinically, pilomatricoma presents as superficial, firm, solitary, slow-growing, painless mass in the dermis measuring up to 3 cm in diameter. Patients may experience pain in response to palpation, discomfort, itching and episodes of infection, discharge, or even ulceration. The overlying skin may be normal or display telangiectasia, hemangioma-like color, or blue-black discoloration or ulceration. In the present case, it is worth noting that the swelling had grown over a period of 1 month on the arm and had achieved an unusual size of 6 cm × 5 cm × 4 cm. Overlying skin showed distinctive whitish discoloration. Accurate preoperative cytological diagnosis is aided by the presence of the diagnostic triad of basaloid cells, ghost cells, and foreign body giant cells. The presence of calcification and nucleated squamous cells further supports the diagnosis. However, when the aspirate shows high proportions of basaloid cells, differential diagnosis should include pilomatrixoma, cylindroma, and basal cell carcinoma. FNAC smears of cylindroma show basaloid cells in jigsaw puzzle arrangement in contrast to saw-toothed edges of basaloid cells in pilomatrixoma. The absence of palisading groups of cells and presence of pink firillary material reliably distinguishes pilomatricoma from basal cell carcinoma. 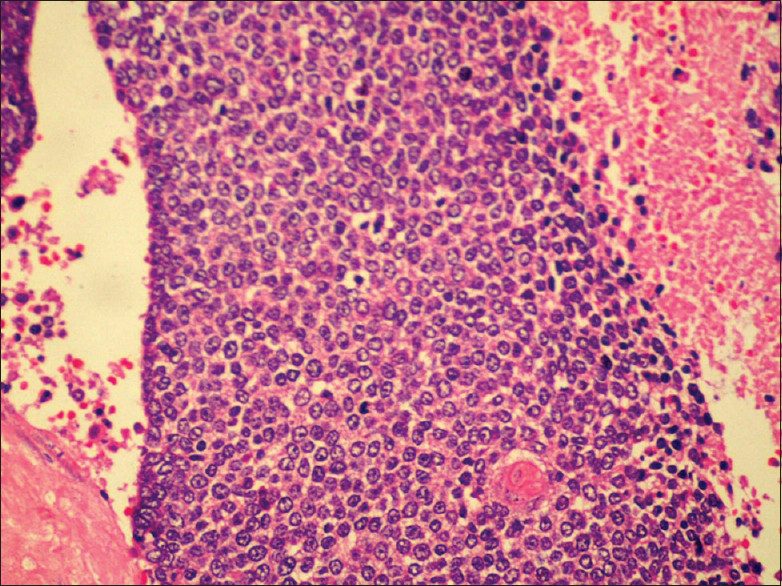 Relatively recently documented entity of pilomatrix carcinoma forms a relevant differential against pilomatricoma, when necro-inflammatory areas with a predominance of basaloid cells are identified in cytology smears as in the present case. However, the absence of nuclear pleomorphism and frequent atypical mitosis cytologically excludes the diagnosis., Nevertheless, histopathology helps in confirming the diagnosis. The histomorphological features of pilomatrix carcinomas appear to be nuclear pleomorphism, frequent and atypical mitoses, central necrosis, infiltration of skin and soft tissues, blood and lymphatic vessel infiltration, and ulceration. In the present case, though there was a presence of necrosis and about 4 mitosis/HPF in the basal cell component, there was absence of blood, lymphatic vessel invasion, and surrounding tissue infiltration. Few cases of malignant transformation of long-standing pilomatricoma have been documented in the literature. Beta-catenin, a downstream effecter in the canonical pathway of Wnt, acting as a signal for cell differentiation and proliferation is implicated in the process. Treatment of choice is wide local excision to minimize the risk of local recurrence in pilomatricoma. Though the presence of shadow cells as characteristic cytologic feature has been repeatedly reported in the literature their detection is in fact difficult cytologically. This is probably due to difficulty in detaching these cells during aspiration. However, in the present case, meticulous examination of smears did show the presence of few ghost cells. Our experience with the present case highlights the unusual clinical presentation and significance of detailed cytohistological analysis of nodule on the arm with unusually large size. Pilomatricoma should be considered in patients with a rapidly growing, cutaneous nodule in the arm with the overlying skin showing characteristic hypopigmentation. One should also understand the importance of accurately distinguishing pilomatricoma from other malignant lesions. The complex smear pattern of different cell types, the absence of clearly malignant cells, and importantly the clinical setting suggest the cytologically accurate diagnosis. Garg LN, Arora S, Gupta S, Gupta S, Singh P. Pilomatricoma: Forget me not. Indian Dermatol Online J 2011;2:75-7. Bansal C, Mishra J. Seemingly insignificant, but crucial cytomorphological leads in diagnosis of pilomatricoma of parotid region. Int J Trichology 2014;6:175-6. Agarwal RP, Handler SD, Matthews MR, Carpentieri D. Pilomatrixoma of the head and neck in children. Otolaryngol Head Neck Surg 2001;125:510-5. Sinhasan SP, Jadhav CR, Bhat RV, Amaranathan A. Pilomatrixoma – Presented as hypopigmented tender nodule: Diagnosed by FNAC: A case report with review of literature. Indian J Dermatol 2013;58:405. Nishioka M, Tanemura A, Yamanaka T, Tani M, Miura H, Asakura M, et al. Pilomatrix carcinoma arising from pilomatricoma after 10-year senescent period: Immunohistochemical analysis. J Dermatol 2010;37:735-9. Aherne NJ, Fitzpatrick DA, Gibbons D, Armstrong JG. Pilomatrix carcinoma presenting as an extra axial mass: Clinicopathological features. Diagn Pathol 2008;3:47.